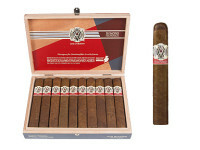 Avo Uvezian never fails to impress, and his most recent release is no exception: The Syncro Nicaragua series draws its name from the “synchronization” of Dominican and Nicaraguan tobaccos, primarily those from the volcanic region known as Ometepe…the soil of which produces an exceptionally fine strain. This, combined with Nicaraguan and Peruvian leaves and an Ecuadorian Connecticut wrapper, makes for an unbelievably enjoyable smoke with elements of citrus and floral notes that must be tasted to be believed. This week’s C.O.W. is the 6″ x 54 Syncro Toro. Try one while you can! They’re indescribably delicious.